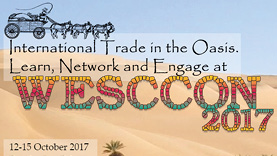 Hundreds of supply chain and logistics professionals gathered to discuss the industry’s latest international trade issues and trends at the annual WESSCON Global Logisitics Conference held in October in Ranchero Mirage, CA. That’s where I joined the president of the NCBFAA, past chair of the Candian Society of Customs Brokers, former president of the National Confederation of Mexican Customs Brokers Association, a senior director of customs/international trade from a leading global law firm, and a vice-president of a southern border customs brokerage firm to make up the panel covering crucial changes in the North American Free Trade Agreement (NAFTA). We spoke on the topic of Single Window: A mirage or an oasis in the escalating demand for detailed trade data. The most notable change having a reaching effect is the February 24, 2016, change to Section 321 De Minimis Value Entry. This change allows for goods being valued at $800 USD or less, to enter duty-free and without formal entry into the United States. This jump, from its original $200 USD, has given rise to a lot of controversy over low-value shipments that may make it through without inspection. There are still restrictions to entry including: goods needing inspection, merchandise that is subject to Anti-Dumping/Countervervailing Duty, and products regulated by Partner Government Agencies (PGA) like the FDA or USDA. This has also lead to some tensions between brokers and express carriers, as the brokers do not have an automated way to file these section 321 entries. A good example of where this could be troublesome is with medical devices or equipment that is entered without the review of the PGAs. The World Customs Organization (WCO) is working toward a sustainable and uniform Single Window implementation for all its member countries. The Single Window platform is a singular data capture point done through all customs electronically, which allows trade parties to efficiently obtain standardized information. All governments have to work with trade flow and trade groups, as the success of this environment is based on interdependent facilities and cross-border regulatory agencies working toward data harmonization. Iniatives have been launched around the world, but still face plenty of political and technological barriers. Not every company has the luxury of a dedicated customs agent to oversee their international trade and supply chain. So where do you turn and who do you rely on to keep you apprised of continually changing policy and custom compliances? Utilizing a compliance solution such as BluJay’s Customs Management brings comprehensive knowledge and real-time updates to your fingertips, dramatically reducing complexity, fines, and operating costs. The software is continually updated to meet the latest requirements and keep you in compliance. Customs is an ever-changing and evolving part of business. Follow our blog to stay up to date on customs management issues, or join us at events like WESSCON for an opportunity to talk to customs experts and learn more about our customs and compliance solutions. Celeste Catano is the Global Product Manager of Customs Management at BluJay Solutions. She has 40 years of experience with the company and is a licensed customs broker. Celeste also serves on the Commercial Operations Advisory Committee (COAC), which advises the Department of Homeland Security on the commercial operations of U.S. Customs and Border Protection and related Treasury and DHS functions. She has been co-chair of the Trade Support Network’s Trade Transition Committee since 2001.